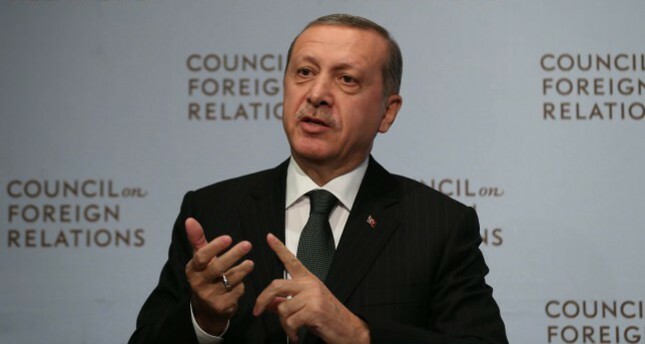 In his speech at the U.S. think tank Council on Foreign Relations in New York as part of the 69th U.N. General Assembly, President Recep Tayyip Erdoğan said that some media outlets and think tanks in the U.S. are under the influence of the smear campaign of the Gülen Movement, which is accused of orchestrating the Dec. 17 and Dec. 25 operations implicating government officials in corruption. "I hope that Turkish and U.S. administrations will cooperate in combatting [the Gülen Movement], which poses a threat to both countries," Erdoğan said. Reiterating the partnership between the U.S. and Turkey, Erdoğan said that he told U.S. President Barack Obama, "Just like we deliver the terrorists you request, you either deport [Gülen] or send him back to [Turkey]." The Gülen Movement is a multinational movement led by U.S.-based imam Fethullah Gülen who lives in self-imposed exile in rural Pennsylvania and is accused of wiretapping thousands of people including Turkish government officials and encrypting phones. The movement has over 140 private schools and charity organizations around the world including the U.S., Europe, Asia and Africa. It has been accused of infiltrating state institutions to gain control of state mechanisms, illegal wiretapping, forgery of official documents and spying. During the recent NATO summit, Erdoğan requested from Obama that Gülen be deported or sent back to Turkey.